I’ve started work on several dulcimers as the finish cures on another. A finish “drying” and a finish “curing” are two very different things. Many craftspeople learn this difference the hard way at some time in their careers; what seemed to be a dry finish turns out to be dry to the touch but not really hard and permanent. One finds fingerprints in the finish after handling or worse, finish sticks to the inside of a case, rubbing out the finish produces a gummy mess rather than the expected level of sheen, etc. It is one of the initiatory experiences that comes with learning a craft. In the photograph is a toothing plane on a walnut dulcimer back. Toothing planes have a serrated or “toothed” edge and the blade is set at a very high angle. The toothing plane scrapes and cuts many small shavings and can be pushed with the grain, against the grain, and across the grain without tearing up the wood. 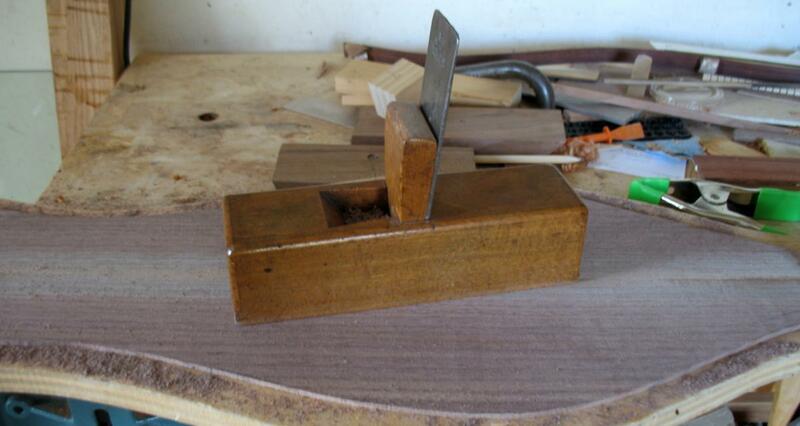 Toothing planes make quick work of leveling and flattening wood with tricky grain and figure. They are also very useful when planing thin wood. The serrated lines left on the wood serve as a map showing which areas are flat and which need more attention. After flattening the surface with the toothing plane I take down the ridges with a smoothing plane or a scraper. On historic instruments traces of a toothing plane having been used can sometimes be seen inside the body of the instrument. This indicates that the outside surface was smoothed and then the thickness was taken down on the inside surface where tool-marks would not be obvious and did not matter. I do use some common woodworking machines to relieve the drudgery of some tasks and to help prevent wear-and-tear on my body, which is showing signs of wear-and-tear. Still, I do as much as I can by hand because it is how I prefer to work. Sometimes I thickness wood partly by hand and partly by running it through a machine. Sometimes I choose one method or the other. It keeps life interesting. Education is when you read the fine print. Experience is what you get if you don’t.